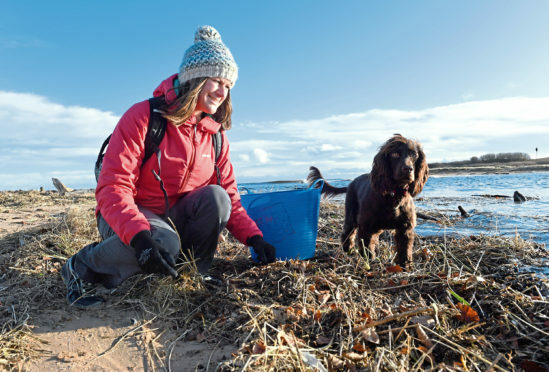 Marine biologist Lauren Smith organises beach clean ups and is often helped by her spaniel Tattie. A marine biologist has called on Scottish fishermen to do more to protect the waters they work in. 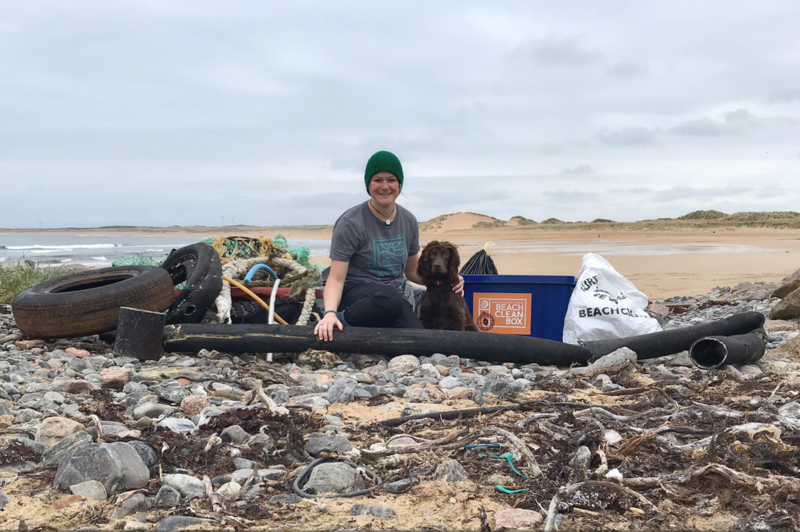 Dr Lauren Smith, founder of Saltwater Life and a volunteer with Surfers Against Sewage, said she found a “nightmare” scene during a beach clean in Fraserburgh on Thursday. Nets and all manner of commercial fishing gear were removed from a stretch of coast during the effort. While much of that will have been unintentionally lost into the North Sea, Dr Smith, from Speyside, said greater efforts must be made to prevent such pollution. In recent months, there have been rescues of seals and other sea mammals and heartbreaking footage of stags whose heads became entangled in washed-up fishing rope. Dr Smith, 35 , is carrying out scientific research on sharks, looking at their biology, evolution and habitat. In her spare time, she volunteers for Surfers Against Sewage, a grassroots movement tackling plastic pollution and protecting coastlines around the country. DR Smith – joined by her dog Tattie on Fraserburgh beach – said: “Marine litter is a problem across Scotland. “Recreational gear is usually localised because it has become entangled and left in situ, but large pieces of commercial gear, such as nets, may have travelled from further afield, being carried in high seas and currents. “A lot of commercial gear is lost due to storms and high seas, if nets and creels are genuinely lost then that’s tough. “It doesn’t make sense to lose a perfectly good net but I have, however, been told that irreparably damaged nets are dumped overboard on purpose to save space or weight on return trips. 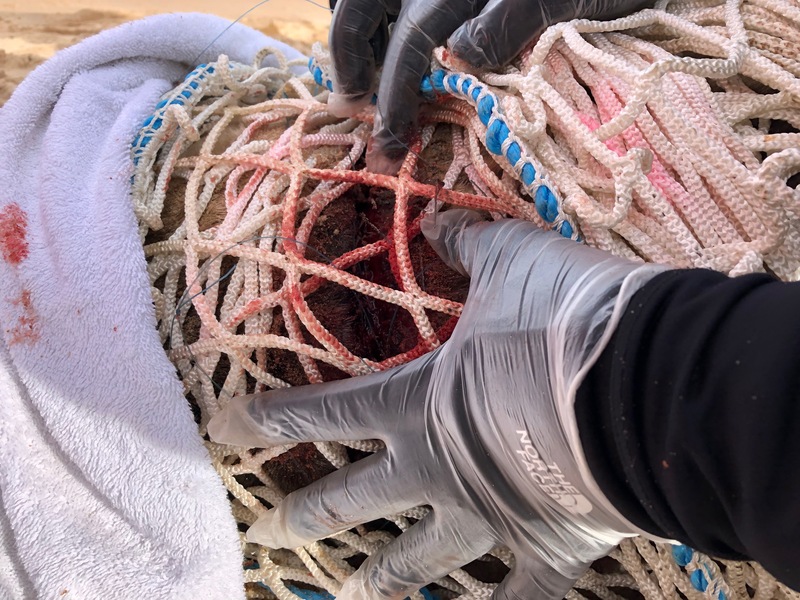 Dr Smith added: “Snagging and entanglement of recreational gear can happen easily and people don’t want to lose their gear, but leaving behind line and hooks, especially baited hooks, can lead to all sorts of issues. Last month, a seal required a six-person rescue after it became trapped in a fishing net at Newburgh Beach. One of the seal’s rescuers, Lee Watson from British Divers Marine Life Rescue, said discarded fishing gear was a widespread problem. He said: “There are a lot of entangled seals that wash onto the shore here. A great many more than people might think. Alistair Sinclair, national coordinator of the Scottish Creel Fishermen’s Federation, said: “I’ve had numerous meetings about the issue of marine litter – it is a huge safety issue. “Fishing gear can wash up from all corners of the world – and I don’t think Scottish fishermen are to blame. The Scottish Entanglement Alliance brings together fishing industry representatives, researchers and conservation charities to provide a monitoring programme to help improve our understanding of the impact of marine animal entanglements. Mr Sinclair added “Fishermen do have a conscience, as opposed to what some people might think.